I’m a big fan of decluttering. I’ve spent several years doing it, writing about it, and talking about it. I’ve gotten rid of most of my stuff, rarely shop for new stuff, and have completely changed my relationship with stuff and shopping. I always thought something new would change my life. I thought I deserved things because I worked so hard. I felt like I needed to own certain things to keep up. I spent a bunch of money, time, attention, and energy on my stuff. I find confidence in who I am, not what I own or don’t own. I know if I wait 30 days before I purchase, I usually won’t want it anymore. I don’t worry about people judging me on the things I choose to include in my home. I spend my money, time, attention, and energy on taking care of myself and people I love, and on projects and passions I really care about. I believe decluttering is a powerful part of the process of simplifying your life, and creating more time and space for what you love. The problem occurs when decluttering takes over and begins to distract us from what we really want. That means something different for everyone, but when we are constantly defeated by not being simple enough, or decluttered enough, we lose sight of what we are really after. The next time you are done decluttering your junk drawer, cleaning out your closet, or donating a box of stuff, stop. Before simplifying further, think about what you really want out of this life of yours. Is this the time to declutter more, or is this the time to deepen a connection with someone you love? Is this the time to move on to your bookshelves, or is this the time to create something new, or serve in your community? Perhaps it is simply time to rest. 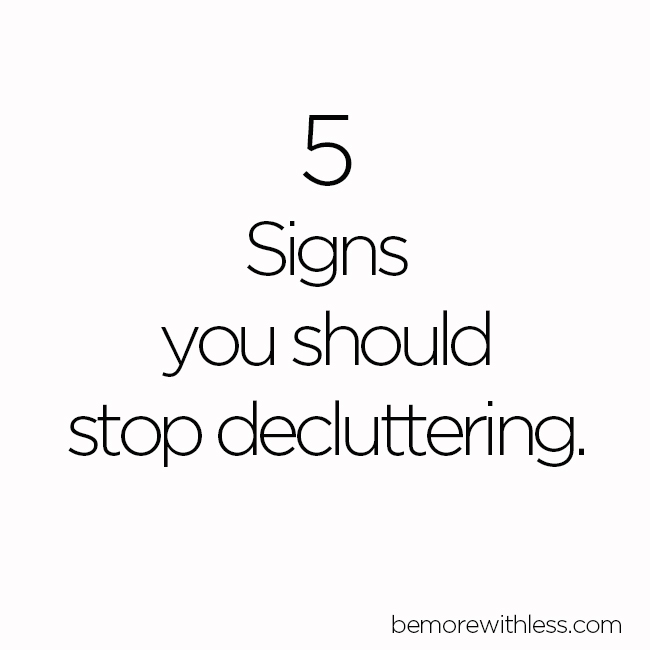 If you aren’t sure, consider these 5 signs you should stop decluttering. Do any of them resonate with you? 1. You are shopping faster than you are decluttering. If empty bookshelves and clear countertops have you sprinting for the nearest department store to fill up the empty space, slow down. Give yourself permission to not redecorate or shop for more. Be brave and hang out in the empty space. Take a little time to think about what you really want and need in your life right now. You might need a break to hang out in your newly decluttered space before subtracting or adding anything else. Be brave. 2. Decluttering feels like a competition or a race. There is no finish line, no one wins for having more or less stuff, and trying to measure the success of your decluttering based on other people’s journeys won’t result in sustainable change, or happiness. Hit restart on your decluttering efforts and move at a pace that works well for you. If that means stopping for a while, stop. Instead of comparing and competing away your accomplishments, zero in on what works for you. Be content. 3. It is so hard for you to let go and decluttering makes you sad and anxious. If you’ve tried over and over again to declutter and let go, but always end up feeling defeated and frustrated, stop decluttering. At least, stop decluttering alone. Ask for help from friends and family, or seek professional assistance. You don’t have to do this alone. Be vulnerable. 4. You feel frustrated when there is nothing to donate. If you’ve spent the last month deep in decluttering and woke up this morning feeling annoyed that there was nothing left to toss, remember to take time to celebrate your accomplishments, and think about what got you inspired to declutter in the first place. Look at how far you’ve come. Be joyful. 5. You are fighting with your family because you gave away their stuff. If you are in a hurry to declutter, and don’t take your family’s feelings into consideration, it might be time to step back and focus on your own stuff. Then, choose love over stuff, and have a gentle conversation with friends and family about why simplicity is important to you. Ask them what’s important to them. Let them deal with their own stuff while you deal with yours and talk about it along the way. Be love. If you’ve been decluttering for a while, and are wondering if you’ve done enough, take some time to live where you are right now. Can you be brave, content, vulnerable, joyful, and loving right here without giving one more thing away? It might not be time to stop decluttering, but if it is, shift your focus to what will make you feel even more brave, content, vulnerable, joyful, and loving. You’ve got the less part worked out, now focus on the more. If you are just getting started on your decluttering journey, these decluttering articles may be helpful. I agree with your 5 examples even though some of them make me sad. I guess decluttering can become addictive and sometimes intervention is needed. I have been there. LOL. I learn to do what you have suggested and take time to sit back and enjoy the benefits of my efforts. This post has really hit home. Thank you. I will Be Brave. Thank you, I needed this post. I’ve decluttered a lot over the last year, but I’ve also beaten myself up for not doing it “better.” Last week I stayed up past 1am online shopping because I needed to replace 2 (out of 4) t-shirts in my capsule wardrobe that tore during an August heat wave. I took hours because I was pressuring myself to find things that perfectly fit my “simple limits”: Second-hand or American made, fit with my wardrobe, within budget, and style I love. These rules are usually fine, but they weren’t simple when I quickly needed comfortable summer clothes. I felt guilty and lost sight of my goal: clothing myself in a pinch. If I’d taken a moment to appreciate that these were the first summer clothes I was buying in well over a year, then maybe I’d have let the guilt go. I could’ve been more flexible about my simple limits, which weren’t so simple right then. I’d have slept well, which is more critical to my simple life than one American-made shirt. 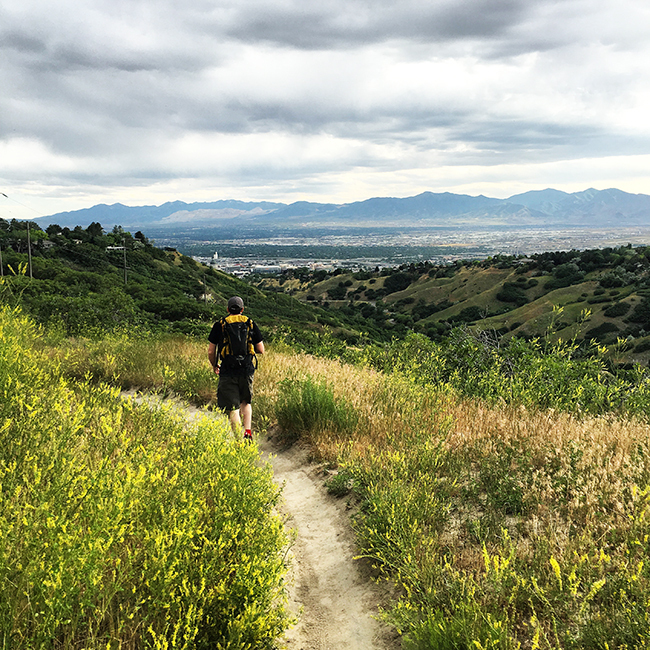 Thanks to your post, I’m letting guilt go and focusing on my successes. For instance, this summer, I packed all of my stuff (minus most furniture and a bike, which I sold), into my small car and moved across the country. I didn’t need to ship anything, which I definitely did when I moved out to my old place. I’ve started a regular jogging habit, too. I’m proud of myself! Wow, this was so needed. I always feel the need to declutter, but if I “over-declutter” I feel the need to replace and refill. Sometimes stopping at a good place is better than ending at a “great” place. So long as I am not adding anything more after decluttering, I will try to be content with not whittling everything down to nothing. Thanks for the reminder! There might be a sixth. EVerytime I see a program, course or group decluttering effort, I want to join. I just filled up a car load for a garage sale without even trying, so maybe I am feeling the urge honestly, but there is such a feeling of accomplishment in creating space that decluttering can become quite addictive. Glad to see this. I reached a point where I was happy with 95% of the things I owned, but was feeling frustrated because my space didn’t “look minimalist.” I have realized lately that I may be more of a “minsumer” than minimalist anyway. I will take a break from decluttering for a little while and see how I feel.